I got a new cookbook! I love cookbooks; I get excited for cookbooks, especially books with a history, and books that are beautifully illustrated. 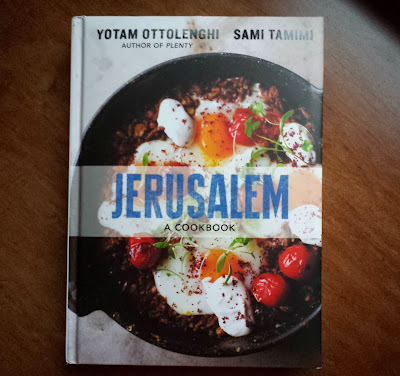 Jerusalem a Cookbook is written by two acclaimed chef/restaurateurs from London who are both from Jerusalem; Sami Tamimi is Muslim and Yotam Ottolenghi is Jewish. This book is a collection of recipes that they grew up on, but with their own twist of course. The recipes are rustic, yet elegant and with ever turn of the page my mouth waters just a little bit more! While I do indeed get excited for cookbooks, I use them more for inspiration than for exact recipes. In this case, I’ve had the butternut squash and farro waiting around for me to put together, and when I saw a recipe in my beloved new book for butternut squash with tahini, well I knew then that tahini would have to go into my recipe! Do you know about farro? Farro is a grain, unprocessed wheat, eaten in the Mediterranean; it is low in gluten, so those with mild gluten sensitivities may be able to digest it. It’s an excellent source for complex carbohydrates. Farro is high in fiber, and protein, it has been found to stimulate the immune system, lower cholesterol and help maintain blood sugar levels. So I’m thinking that after all of the Thanksgiving indulging/gluttony that’s about to take place, that many of us are going to need to set things right and that this yummy healthy dish will help us to get back on track…at least until Christmas. Heck maybe you are one (there are a few of you) who wants to serve healthy dishes at your feast, this would be might fine alongside a roasted bird! Now that I’m so excited by my new book, be prepared to see a whole lot more Middle Eastern inspired dishes here at Loaves n Dishes! It seems that Bob has been my go to guy for grains as of late! Prepare 1 1/2 cups of uncooked farro according to the package directions. Don't forget to add salt to the water, if you forget and add salt to the farro after it's cooked, you will end up having to use an awful lot of salt to get it to taste good. Peel and remove the seeds of a small butternut squash and cut it into 1/2 inch cubes. Lay the squash out in a single layer on a sheet pan, season with extra virgin olive oil, ground coriander, ground cumin, salt & pepper. Roast in a pre-heated 400 degree oven for 10 minutes. Remove the squash from the oven and add some diced onions; return to the oven for another 15 minutes. Add some roughly chopped walnuts and return the pan to the oven once again for just 5 minutes longer. Drain the cooked farro really well, and add a couple of tablespoons of walnut oil or extra virgin olive oil. Add the farro and roasted vegetables to a large bowl. Also stir in some chopped dates and chopped flat leaf parsley. Farro with Butternut Squash is quite tasty just as it is, but for an added layer of flavor you may like to make this simple Tahini Lemon Sauce to add to the dish. Start by working a small clove of garlic into a paste. Add the garlic to a small bowl with the juice of one lemon. Stir in a couple of tablespoons of Tahini, a little honey, water, salt and pepper. ...Or serve the sauce on the side; either way it's a colorful, nutritious and delicious dish! 2. Prepare the farro according to the package directions. Drain the cooked farro well and add it to a large bowl. While the farro is hot stir in 2 Tbsp. of walnut oil (or extra virgin olive oil). Set to the side. 3. At the same time as the farro is cooking prepare the squash. Lay the butternut squash on sheet pan; season with 2 ½ Tbsp. olive oil, coriander, cumin, 1/8 tsp. each of salt and pepper. Spread the squash into a single layer and roast in the hot oven for 10 minutes. 4. Remove the squash from the oven and add the onions, roast for another 15 minutes. 5. Sprinkle the walnuts over the squash and onions, and roast for a final 5 minutes. The squash should be tender. 6. Add the butternut squash mixture to the large bowl with the cooked farro. Gently stir in the chopped dates and parsley. If desired stir the Tahini Sauce into the farro as well (or serve the sauce on the side). 1. Whisk all the ingredients together in a small bowl. I've been using tahini with lemon juice for salad dressings and have been oooooobsessed with it! 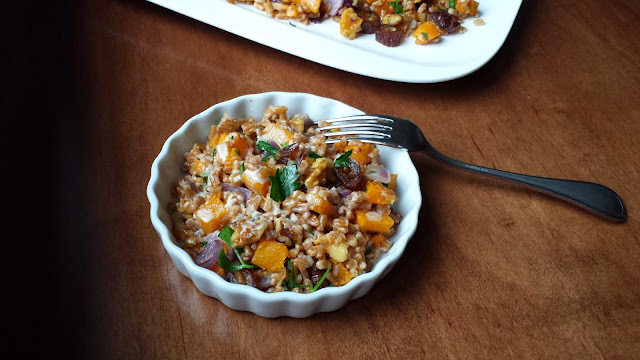 This farro looks amazing..loving the tahini and butternut squash! Must get ahold of that cookbook!! I have heard great things about that cookbook. I listened to a special on the radio and I've wanted it since then. This farro looks delicious. So good! This looks very appetizing and tasty, Karen. Me too, I collect cooking books and love to read them for inspiration. Thank you for the interesting info about farro.